April 26, 2017 is National Pretzel Day and to help you celebrate a number of pretzel shop chains are offering a free or discounted pretzel. - Auntie Anne's - "My Pretzel Perks" app users will have a choice of one free Original or Cinnamon Sugar Pretzel, redeemable from Wednesday, April 26 through Sunday, April 30, 2017. You have to download the app by 11:59 PM EST on April 26 to get the offer. - Ben's Soft Pretzels - Get a free pretzel 1 PM - 7 PM on Wednesday, April 26, 2017 when you make a minimum $1 donation to the Intrepid Fallen Heroes Fund. - Philly Pretzel Factory - Get a free pretzel at all traditional and Walmart locations on Wednesday, April 26, 2017. 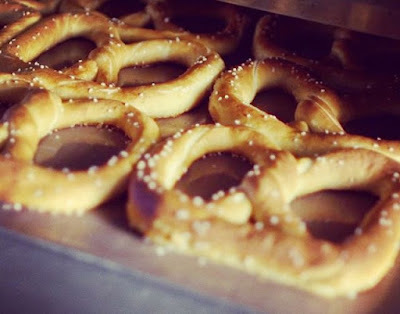 Additionally, each location will award the first 100 customers in line with a card redeemable for a free pretzel every day throughout the month of May. - Pretzelmaker - Get a 26-cent salted or unsalted pretzel at participating locations on Wednesday, April 26, 2017 when you sing them Happy Birthday. - Wetzel's Pretzels - Free Original Pretzel on Wednesday, April 26, 2017 at participating locations (theme park, airport, and arena locations are excluded). If you download their smartphone app, you can get a coupon for a free bonus pretzel redeemable April 27 - May 1, 2017.